TOPS 2-Sided Bi-Weekly Time Cards work the same as equivalent cards from your time clock manufacturer. Manila cards show numbered days 1st–7th. Use the right side to track regular time and the left to track extra time. Includes space for tracking pay rate, deductions and net pay. A green front and red back differentiate the pay weeks. Easy, economical and efficient. Bi-Weekly 2-Sided Time Cards. Regular/Extra Time. 3-1/2"" x 9"". 500 Cards Per Box. Save over manufacturer's brands: The old adage ""time is money"" was never more true. 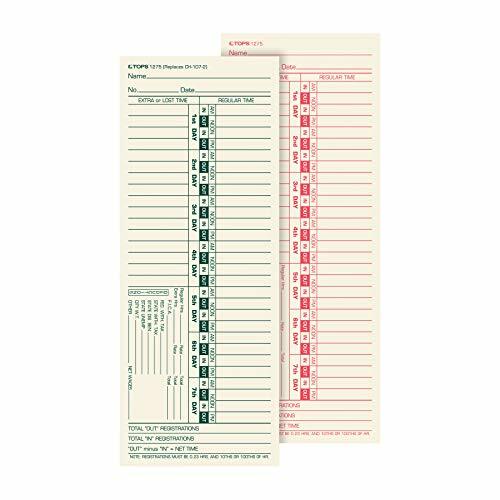 These sturdy time cards are a bargain and work the same as big time machine brands. 7 Days A Week: Manila cards show a seven-day time period to start on any day, first through seventh. Deductions Box: Includes an area to calculate regular hours, extra hours, deductions, gross and net pay per week. Value Packs: Stock up on this essential. Get 500 time cards per box.